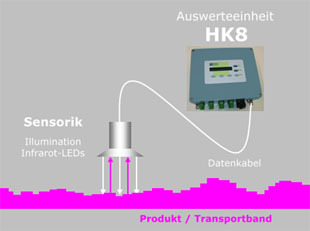 The HK8 is a device for continuous NIR reflection measurement with infrared LED's. The NIR-H2O-Meter is a modular unit, evaluation and sensor system are mounted in different housings. The distance between sensor system and product can be up to 50 meters. The measured value of the H2O content is available as digital (RS232, optional RS485) and analogue value (0/4-20mA). In contrast to conventional IR or NIR systems from other suppliers, the HK8 does not work with color filters or halogen lamps, and offered therefore improved stability of the measurement. The lifetime is up to 10 years. The drift of the measurement value, as is the case with other IR / NIR instruments, has been fully compensated. Colourvariations of the product has no influence in the measuring result. Also uneven surfaces of the product, such as coarse bulk materials, can be measured. The HK8 has a very high reliability and very low maintenance costs. The sensor system is located over the detected product surface. The products (e.g. 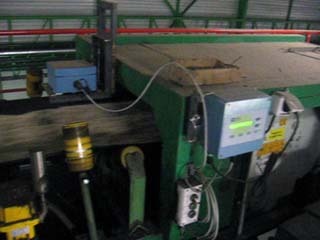 paper webs, width of material and any kind of bulk material) are moving on a conveyor belt under the sensor system. The calibration of the HK8 is done with our easy to use Specter8 software.